I feel like the months are getting better and better. I've had the most wonderful year so far and I couldn't have asked for more than what 2017 has already delivered. This July I've seen friends, made friends, achieved goals, finished things and enjoyed life. 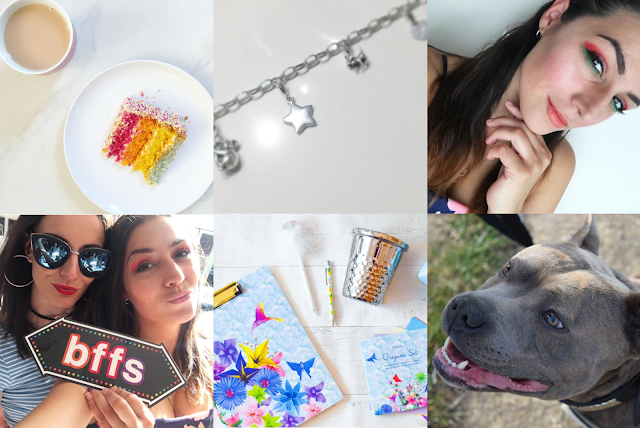 So much has happened in July and I already feel like this is going to be a long post! So right at the beginning of the month I spent about a week celebrating my graduation! I was on a high for a whole week at least eating rainbow cake every other day and spending my time smiling a lot and appreciating the congratulations online and at work! It was also my sister's birthday at the beginning of the month too. 14 years old. She was born when I was 13... I can't believe she's a proper teen now. Anyway before I begin to feel old... we had a lovely party for her with all my friends and I even invited my own friends too! You'll know my bestie Ana from many of my other posts. We spent a lot of time together this month actually. Anyway, it was a lovely day and we spent the whole time talking, bantering and chatting away with my family and just having the nicest time really. The weather was great too so a perfect house/garden party atmosphere. 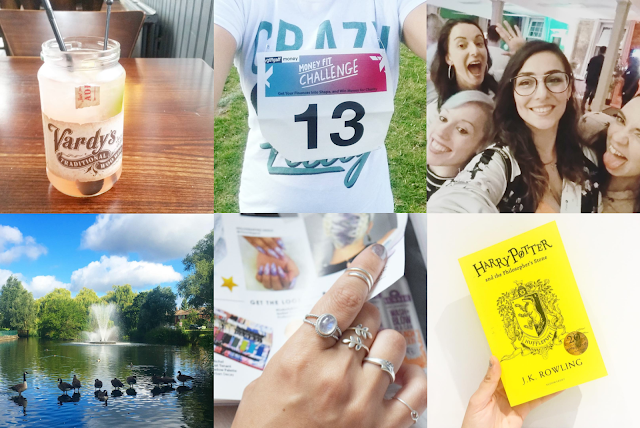 I spent a lot of July training for a run too - for what would be my first 5k run ever with GiffGaff for their #MoneyFitChallenge! I decided to run for the Happy Staffie Rescue and I was hoping to win a chunk of money for them, but I didn't manage to stay on the rodeo pig long enough to win the money. It's all a bit confusing at the moment but there will be a blog post soon to make that sentence less weird and make more sense... But yes, I did do the run in the end - with Ana - and though it was not my best time, it was an awesome time for someone who had a bit of a chesty cough and food poisoning the weekend before! With the academic year coming to an end, I had lots going on mid July work-wise but it did mean that I began my summer holidays too and would be enjoying 6 weeks off! I did although go into work a couple of days last week but it was thoroughly enjoyable because I got a lot done. Last week was definitely the busiest of all the weeks. I had work three days of the week, a day out in London and just one day at home I used to organise myself. On wednesday I had an exciting day though with a facial review in London in the afternoon and in the evening I met up with Ana to attend the #ImmersiveNightIn with Curry's PC World and Sony! It was the most brilliant day out and I made a few new blogger friends too. Posts about both those experiences to follow! (Looks like I've got a lot of posts to do soon!) Oh, and I also attended the Arsenal vs Benfica football game last weekend too! It was a pretty amazing experience and my favourite football experience to date. Arsenal won of course and we got to celebrate with hot dogs and drinks! John also bought me my first Arsenal shirt. LOVE. It's been a pretty great month for me as you can see. Super busy and super fun too! I couldn't have asked for a better month. August is going to be more chilled out but just as lovely I'd suspect. August brings chill out days, lots of time with my Dolly dog, reading, sleeping in and new beginnings too. I should write about that also. As you might be able to tell, I'm really happy and feeling super motivated. I also have my blogging mojo back. There's so much I want to write and share and I can't wait to update you on everything. I feel like the blogger I was before and it feels so nice to be her again. Anyway, I hope July has treated you well and August treats you just as brilliantly if not more! Let me know... what have you got planned for the month ahead? Ive got a day trip to Skegness with my friends as well as Brighton and a weekend in Disneyland Paris! Sounds like you had a great month girl!